Wikipedia maintains a catalog of Bad Jokes and Other Deleted Nonsense (BJAODN) -- it's the best of the worst stuff added to Wikipedia. Here, I present 11 excellent pieces of dumb humor that was deleted from Wikipedia...but then retained on a best-of page, because it's just that bad good. 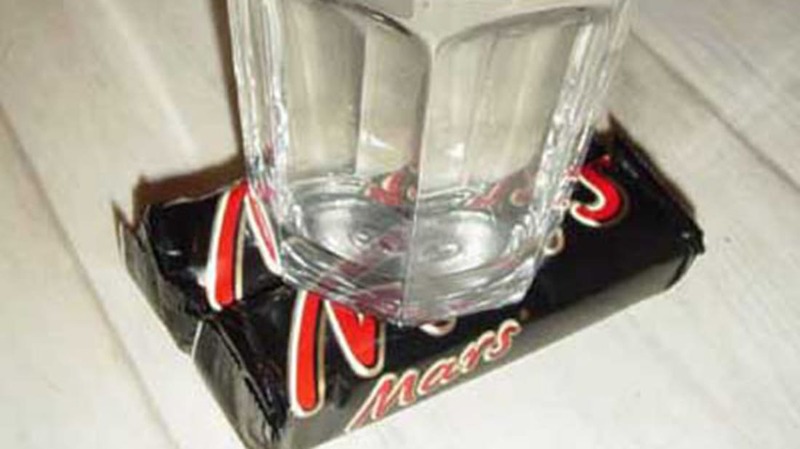 On April 1, 2004 a Wikipedia user discovered shocking proof -- photographic proof -- of water on Mars. The photograph was posted to the heart-laden article "♥Water on Mars♥" and the image is still retained (Creative Commons license and all) on Wikipedia, though it carries this bold warning: "This is a very bad joke. We believe it to be one of the most humorous examples of the Wikipedia community's work." A Wikipedia editor commented: "Evidently, there is also glass and a plastic wrapper and now MY JAWS!" Q. Why was the teacher cross-eyed? A. Because she couldn't control her pupils. If you succeed in tipping a cow only partway, such that only one of its feet is still on the ground, you have created lean beef. Such a feat is well done. Naturally, being outside, the cow is unstable. When it falls over, it becomes ground beef. An editor then inserted: "Such quality of humor is rare." Th'u~nks as a religion, was born when two prophets — known as the Two Great Piephits by practitioners of the religion — discussed the greatness, and spiritual meaning that can be found in the humble pie, particularly the pukka (pronounced "puck-ah") variety. Currently it has believers in countries around the globe. In the year 2006 CE the Piephits were discussing the benefits of the pie over other pastry based savoury foods, when they were struck by a joint moment of revelation. This moment, known as The Pievation, was believed to be the moment when the Master Baker showed the true meaning of pastry, and consequently life to the Two Great Piephits. From this they jointly established the main underlying tenet of the religion, that of B'heegery and thus Th'u~nks was born. This continues for quite a while. Alternative rock is the name given to one stone when you're looking at another stone. The term was coined by photographer Edwin Blastocyst when looking at one stone and speaking about another, oddly enough. The quote from Edwin Blastocyst needs to be verified. The Voltaic Democratic Union, which is actually a thing, started out as a "stub page" (starting point) featuring the text: "Shocking, just shocking!" The Baby Catapult is an invention of insane genius Maxwell Q. Infantlauncher of Indianapolis, Indiana. It is not meant to launch actual infants; it is meant to launch Cabbage Patch Kids and the sort. The goal is for them to go 100 feet in the air, and 500 feet along the ground. The catapult should be finished by mid-2004. An editor noted: "I, for one, am disappointed." This mini-essay on the rhetorical form of Cookie Monster's discourse was added to the page C is for Cookie and then, sadly, removed. C is for Cookie can be regarded as a case study in persuasive oratory, emphasizing the emotional aspect of public speaking. Cookie Monster builds excitement by answering his opening rhetorical question, "Now what starts with the letter C?" with the obvious reply, "Cookie starts with C!" He then challenges the audience, "Let's think of other things that starts with C," before quickly replying, "Oh, who cares about the other things?" casually dismissing a whole range of other possibilities as irrelevant. Thus, having ostensibly come for the purpose of covering the letter C in its entirety, Cookie Monster has already focused his agenda exclusively on cookies, employing the classic bait and switch tactic. Several times in his presentation, Cookie Monster emphasizes what appears to be the central thesis of his remarks: "C is for cookie, that's good enough for me!" The appealing rhythm of this slogan appears designed to entrance listeners, swaying their emotions and making them instinctively want to chant along with him. After rousing the crowd, Cookie Monster systematically lays out the logical underpinnings of his pro-cookie ideology, comparing cookies to round donuts with one bite out of them and to the moon during its crescent phase, in essence using a straw man argument that implies his opponents would advocate the superiority of these competitors over cookies. In this sense, Cookie Monster may be proposing a false dichotomy representing cookies as the only viable choice to a group of obviously inferior alternatives. But before the audience has a chance to catch on, Cookie Monster launches into another round of repetitive chanting, "C is for cookie, that's good enough for me, yeah!" as young children sing along. Here, Cookie Monster uses a propaganda technique strikingly similar to that employed in George Orwell's Animal Farm by the pig Napoleon, who trained the farm's sheep to bleat, "Four legs good, two legs bad" on his cue. Cookie Monster then adds visual stimulation to his discourse by chomping into a large cookie, concluding his remarks with "Umm-umm-umm-umm-umm" and other chewing sounds. Another addition was an entire section titled Other Things Starting with the Letter C, including Carrot, Crabcakes, and Cucumber. There's a whole page of this, and it includes links to several more "best of BJAODN" lists. One of my favorites in those extra lists is a spoiler-filled plot summary of The Very Hungry Caterpillar (with philosophical commentary).